Making dried fruit can be a fun family activity with a tasty end product. Dried fruit is a portable snack and it also can be used in recipes. Proper and successful drying produces safe food with good flavor, texture and color. Whenever you preserve foods, choose the best-quality fruits and vegetables. As with other food preservation methods, drying does not improve food quality. The following fruits were rated as “excellent” or “good” by the University of Georgia for their quality after drying: apples, apricots, bananas, cherries, citrus peel, coconuts, currants, dates, figs, grapes, nectarines, papayas, peaches, pears, pineapples, plums and rhubarb. Other fruits also are suitable for drying. Select high-quality, fully ripe fruit, and discard any fruit with decay, bruises or mold. Thoroughly wash and clean fruits to remove dirt. Cut foods into c-inch to ½-inch slices. The higher the water content, the larger the slice size should be. Small slices of high-moisture foods would disappear when all the moisture has evaporated. Pretreating light-colored fruits before drying is important for the quality and safety of the final product. Soaking the sliced fruit in an acidic solution preserves the color and texture of the dried fruits, and it increases the destruction of potentially harmful bacteria during drying. These treatment methods are courtesy of Colorado State University Extension. 1. Ascorbic Acid Pretreatment: Pure crystals of ascorbic acid (vitamin C) can be found at supermarkets and drug stores. Stir 2½ tablespoons of pure ascorbic acid crystals into 1 quart of cold water. This amount of solution treats about 10 quarts of cut fruit. For smaller batches, adjust proportions accordingly. Soak the fruit for 10 minutes, then remove it with a slotted spoon, drain it well and dehydrate it. 2. Citric Acid Pretreatment: Citric acid is available in the canning section of many supermarkets. Stir 1 teaspoon of citric acid into 1 quart of cold water. Add the fruit and allow it to soak for 10 minutes, then remove it with a slotted spoon, drain it well and dehydrate it. 3. Lemon Juice Pretreatment: Mix equal parts of lemon juice and cold water. Add the fruit and allow it to soak for 10 minutes, then remove it with a slotted spoon, drain it well and dehydrate it. Some fruits have tough skins. For successful dehydration, the skins must be “cracked” before being dried as whole fruits. To crack the skins of grapes, plums, cherries, berries and other fruits with tough skins, dip the fruits in briskly boiling water for 30 to 60 seconds, then dip them in very cold water. Drain them on absorbent towels before placing them on drying trays. Drying is not a precise method of food preservation, and the amount of drying time will vary depending on the equipment, moisture content of the fruit and the humidity in the air. Spray a cookie sheet or similar flat tray with vegetable spray, or line the tray with plastic wrap or parchment paper and spray with vegetable spray. Another option is to use the specially designed plastic sheets for electric dehydrators, and follow the manufacturer’s directions. Oven drying: Test your oven to be sure it can maintain a low enough temperature; otherwise, “case hardening” may occur. This is the formation of a “crust” on the food, which prevents the interior from drying properly. To test your oven, set it to the lowest setting. Place an oven-safe thermometer on the rack where food will be placed. Leave the oven door open 2 to 6 inches. Place a fan near the open door to circulate air. Check the temperature. If your oven can maintain a low enough temperature (140 to 145 F), it may be used for food dehydration. Racks should be 2 inches apart, with at least 3 inches of clearance from the top or bottom to the rack. See Table 1 for approximate drying times. Note: Oven drying is not a safe procedure to follow if young children and pets are present. 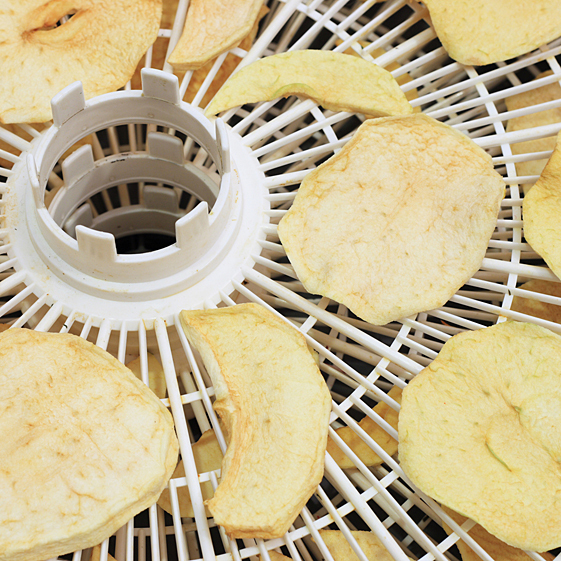 Food dehydrator drying: Follow the manufacturer’s directions. Table 1: Steps for Drying Fruit. Fruits should not be dried to the point of being brittle or hard; they should be leathery and pliable. To test for dryness, remove a few pieces and allow them to cool to room temperature. Squeeze a handful of the fruit. The pieces should spring apart when released. Cut several cool pieces in half. You should not see any moisture, and the fruit should not be sticky. After drying, the “conditioning” process helps equalize moisture among the various-sized pieces of fruit. It lessens the chances of mold growth and other spoilage. To condition, place cooled dried fruit loosely in glass or plastic containers. Lightly cover the containers and store them in a dry, well-ventilated place, stirring or shaking the container(s) daily for four to seven days. If moisture condenses in the jar, return the fruit to the dehydrator or oven for further drying, then repeat the conditioning process. Pack cooled dried fruits in small amounts in dry glass jars (preferably dark) or in moisture- and vapor-proof freezer containers, boxes or bags. Using glass containers allows you to see moisture buildup on the interior immediately. Put the containers in a cool, dry, dark place or in the refrigerator or freezer. Properly stored, dried fruits keep well for six to 12 months. Discard foods that have off odors or show signs of mold. Dried fruit can be eaten as snacks as-is or reconstituted for use in pies and other recipes. To reconstitute, place fruit in a pan and cover with boiling water; simmer covered until tender (about 15 minutes). For more information about growing, preserving and preparing fruits and vegetables, visit the NDSU Extension Service website. E.L. Andress and J.A. Harrison. 2006. So Easy to Preserve (5th Edition). University of Georgia Cooperative Extension Service. J.A. Harrison and E.L. Andress. 2000. Preserving Food: Drying Fruits and Vegetables. University of Georgia Cooperative Extension Service. P. Kendall and J. Sofos. 2007. Drying Fruits. Colorado State University Extension. The information given herein is for educational purposes only. Reference to commercial products or trade names is made with the understanding that no discrimination is intended and no endorsement by the Extension Service is implied.